I was a little confused when I applied for a Philippine passport about three years ago. DFA's Consular Office is flooded with people and there are so many queues. I also experienced being surrounded by many “passport agents” before I entered the DFA office. In short, my experience when I applied for a Philippine passport is not good. So, it is good news that the Department of Foreign Affairs made an online appointment system for the application and renewal of Philippine passport. The good effect of this is that the long lines at the Consular Office will shorten because DFA can control the number of people that it will entertain per day. 1. Go to the DFA Passport Appointment System website. Fill up the reCaptcha form and click on the “Start Individual Appointment Process”. 2. Fill out the application form completely. 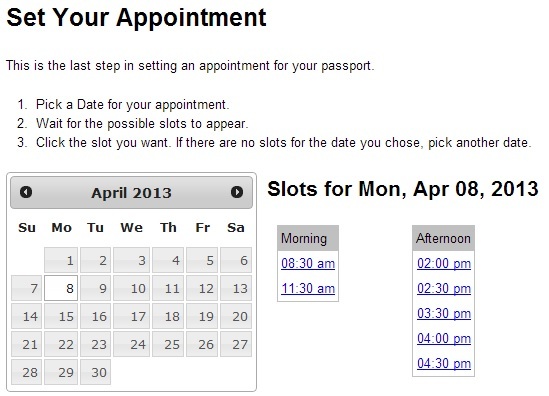 Screenshot of the Philippine passport online appointment form. 3. Double check the information that you typed in the application form. Make sure that they are correct. Keep in mind that wrong information will give you problems when you are already in the Consular Office for your personal appearance. 4. Click the “Submit” button located at the bottom of the page after you checked that the info in the application form is correct and complete. 5. A pop-window will appear. Just click the “Yes” if you want to submit the information that you typed in the application form. 6. You will be directed to a page that contains important reminders for the renewal or application for Philippine passport. Take note of the information written on this page. After that click on the “Continue” button at the end of the page. 7. You'll be directed to another page with important reminders. Take note of these info. After that click at the “Continue” button at the end of the page. 8. In the next page, you'll be asked if you're ready to proceed or not. 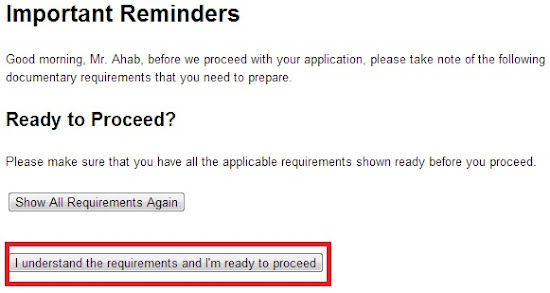 Just click on the “I understand the requirements and I'm ready to proceed” button if you're ready to proceed to the next step. 9. The last step is setting the date of your appointment. For this step, you must pick the date that you want to go to DFA. Just use the calendar located on the page and click on the day that you want. Then wait for the possible slots to appear. Choose another appointment date if there is no available date on the day that you chose. 10. A page will appear asking you to confirm your application by clicking the confirmation link on the email sent by DFA. Make sure that you confirm within 24 hours or else your appointment will be canceled. 12. Print your e-passport application form on long bond paper. Then you're finished with making online Philippine passport appointment with DFA. All you have to do now is to prepare the required documents and make sure to photocopy all of it. You should also have at least one valid ID for Philippine passport application. Go to the Consular Office 30 minutes at most before your appointment time. Notes: The steps listed here is just for individual appointment at the DFA. For family application, please go to Family Application form of DFA. If you're applying for a Philippine passport because of medical reasons (i.e. you will go for medication abroad), incident of death or an OFW with job placement order then you must DFA Emergency numbers: 834-4424 and 834-4855. You need to call those numbers so your passport will be processed quickly. For information on going to Consular Affairs Office, please read my post: “How to Go to DFA Office”. For more info on applying for Philippine passport, please read my tips on applying for Philippine passport. Mukhang magre-renew ng passport si Xoxo_Grah ah. Gagala kanaoutside of the Philippines? After I click the link for the confirmation inmy e-amil itgives me a 'SERVER Error? Please advise ? Is my conformation reference number recognized by the system? It seems like the DFA is having a problem. I suggest that you call the DFA. Here is their hotline: 556-0000. You can call DFA using this hotline Monday to Friday from 8 AM to 5 PM.